This Sunday, we will be celebrating one of the most important holidays as believers; our Lord Jesus Christ’s death and resurrection. In R-kids Discipleship Co-op, we are praying your children hear the good news that the Lord is risen! This day is so much more than dying eggs and eating chocolate bunnies. Although, we love all those things and incorporate them in our celebration, we want most importantly for your kids to remember and rejoice in the new life that is ours because of Christ’s sacrifice for our sins and triumph over the grave. Please Join us!! Easter Service times this Sunday, April 21st: 7am (family style) 8:30am, 10am, 11:30am and 1pm. Last week the kids took home stickers as a way to invite friends to Easter service. If they haven’t invited a friend yet, please encourage them to do so! What a great opportunity to live “sent” this Easter! 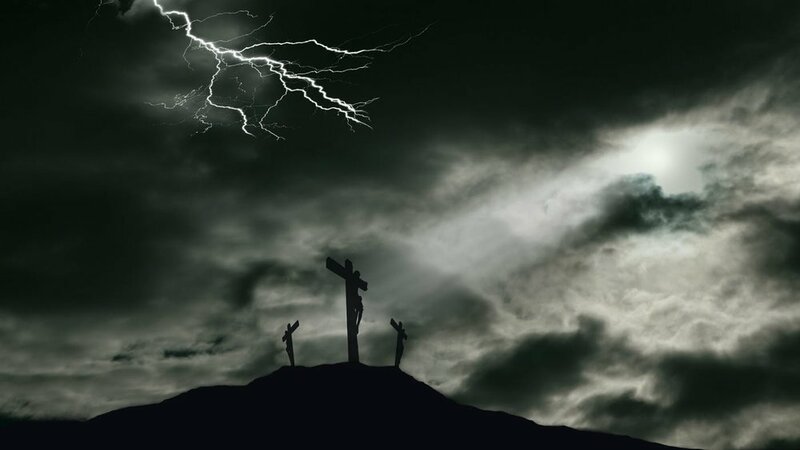 Easter day our kids will be learning about Jesus’ crucifixion and resurrection from Matthew 26-28. We will have worship time and crafts as usual. The 2nd-5th grade class will be watching the baptisms happening upstairs via tv screen in the classroom. If your child has a desire to be baptized this Easter, there is still time to sign up! Follow link below for more information about baptisms and Easter Sunday Services. O death, where is your victory? As Good Friday approaches on April 19th, we would like to remind you about how the night will be planned. We are looking forward to celebrating Good Friday as a church family, and we are especially excited to share this special evening with your kids downstairs. Kids ministry will be during the 6:00 pm service time only. All classes for each age group will be open, and we will be showing an Easter movie along with a short lesson. We are praying this will be a memorable evening for our children, and that God’s good plan will be heard in the hearts of all the children in R-kid’s Discipleship Co-op. If you are a parent with a child who has been asking about baptism or may be ready to be baptized this Easter, we sought out to share with you wisdom from a family that has already wrestled with and answered the question, "is my child ready for baptism?" Two years ago, on Easter, Logan was baptized. We sat down with him and his dad to talk about his experience. Watch this short video below to see just how God prepared Logan's heart for this testament of faith, and how his parents knew he was ready for this monumental moment. Some of you may just be starting to talk to your kids about baptism and some of you may have kids who have already chosen to follow Jesus and be baptized. Wherever you are in this journey of discipling your children, I hope that you are encouraged by hearing this story. Pastor Daniel gave us some great examples of how to approach baptism with our children. He listened to Logan's questions and taught what baptism was, he waited patiently for the Lord to give Logan the desire to be baptized, and was affirming and supportive of Logan when he was ready to be baptized. Like Logan, many of the kids in our older classes have professed that they are Christians and desire to be baptized. We know that the best choice our children can make is to follow Jesus and receive salvation through Him! As you teach your children more of what it looks like to follow and obey Christ, I hope that you will lean into the Lord and keep trusting Him to guide your conversations about being a disciple. Be patient on the Lord's timing and give yourself some grace as you learn how to approach the subject. You don't have to do things perfectly, you just need to give it a try and trust God with the rest. Only the Lord knows who will be saved and how our days will go. Everyones's story will be different, and that is such a beautiful thing. God has perfectly and strategically planned your child's story, and He promises to be with you always. Continue to trust Jesus with your child(ren) and do not be discouraged if your child just does not yet seem ready, or has not yet decided to follow the Lord. The Holy Spirit will help you as you look to Jesus as your strength and guide to discipling your children. "May he equip you with all you need for doing his will. May he produce in you, through the power of Jesus Christ, every good thing that is pleasing to him. All glory to him forever and ever! Amen." If you would like more support in how to talk to your children about faith or baptism please do not hesitate to contact me. I would love to pray with you and offer support and encouragement in any way possible. What great news that in Christ we are made new and the old has passed away; this truth is huge encouragement for me and was especially on the day I was Baptized. As Easter approaches quickly, and we wait in joyful anticipation to celebrate the day our savior, Jesus Christ, rose from the dead; let’s also take this time to consider baptism. We will be having baptisms during our Easter services and it’s a great privilege, as parents and volunteers in R-kids, to walk with our children as they make the decision to be baptized. For kids who have made the exciting choice to publicly announce their faith, we would love to guide and equip them during their journey leading up the the big day. Please join us for our new Baptism Starting Point Class for Kids! If you plan on registering your child to be baptized this Easter please attend this class at 10:30 on April 7th and 14th. This class is a parent and child class intended to help your child who has identified that they would like to be baptized prepare for baptism as well as create a place for helpful, guided conversation about the what, why, and when of baptism. We will review what we have learned in class lessons; ask children to share their testimony; and spend time talking about the practicals of being baptized here at Resurrection Church. Please don’t hesitate to contact Janelle Dutcher anytime with questions, comments, or concerns. We are praying for you and your children during these weeks leading up to Easter. Letter to parents: How do I lead my child to the decision of baptism? Easter is right around the corner (April 1st ) and part of the Easter celebration is baptism! This is a glorious day in which people make public their faith and devotion to Jesus. It says they are ready to shed their “old self” and as they emerge out of the water it is a symbol of their new life in Christ. So, as a parent how do you talk to your child about making this decision to trust Jesus as their personal savior? How do you know if they're ready for baptism? In my own personal experience as a parent, I was not equipped to have this conversation with my children. I desperately wanted my kids to know, love and trust Jesus but I had no idea how to do it. It was awkward. What should I say? This is really important…I didn’t want to mess it up! In the next 3 weeks leading up to Easter, R-Kids Co-op will be doing short teachings on baptism in our 2nd-5th grade classes. We’re going to talk about the basics of baptism, why we get baptized, what actually happens on baptism day (relieve any fears about baptism), and how do they know when they’re ready. These mini classes are designed to touch on the basics of baptism and to supplement (not replace) what you’re doing in the home. Every child is different when it comes to baptism and the Holy Spirit works in each child’s heart in his own time. So, these 7 considerations are just that…considerations and not a formula. They are intended to provide you with basic guidelines that will allow you to approach this process with joy and anticipation! Pray for your child’s salvation. Pray that the Holy Spirit will be with you and your child during these conversations. Pray for wisdom, discernment, and patience. Teach them about the basics of baptism. Janelle’s letter of last week provided a great baseline. It addressed why we should get baptized, who should get baptized, what baptism does NOT do, and what baptism Does accomplish. Make sure you use terms and language they can understand. Our job as parents is to plant seeds and allow the Holy Spirit to faithfully work in the lives of our children. Be patient…allow the Holy Spirit to work…don’t push your child to make a decision. A very powerful parental moment is when you tell your children about your own testimony and baptism. Talk about what life was like before you put your trust in Jesus and what life was like after you put your trust in Jesus. Talk about your own baptism experience! God is great: God is mighty, majestic, all powerful, and the creator of the heavens and the earth. He is perfect in every way and is without sin. God desires a personal relationship with each of us. We are sinful: We are not perfect, we make mistakes, we are sinful. Because we are sinful we cannot have the relationship with God that He so desires. God sent Jesus: God loves us so much that he sent his only son (Jesus) to take away our sin…past, current, and future sins. When Jesus died on the cross he took all of our sins away so that we can now have a relationship with God. Believe in your heart: If you say Jesus is your Lord and you believe in your heart that Jesus died on the cross and God raised him from the grave, you will be saved! Life with God forever: If you confess that Jesus is Lord and believe that God raised Jesus from the dead you will be with Jesus forever! And this is just the start of a lifelong relationship as a disciple of Jesus. Do you confess that Jesus is Lord and believe in your heart that God raised him from the dead? Have you confessed and repented of your sins to God? Step 5: Change into baptism clothes…the church will provide a t-shirt, flip flops and towels…you bring a pair of shorts. There is a special private place to change. Parents will be with their child through the whole process. Step 7: You will plug your nose, cross your arms, and will be gently laid back into the water for just a second and then helped back out of the water. Step 8: There are a ton of towels available to help you dry off. Step 9: You return to the special private room to change back into your dry clothes. Step 10: Celebrate your new life in Jesus Christ. Last week we talked about Baptism 101…the basics of baptism. This week we discussed how to talk to your children about putting their trust in Jesus and baptism. Next week we’ll talk about how to determine if your child is ready for baptism. Please don’t hesitate to reach out to me or Janelle Dutcher anytime with questions, comments, or concerns. I’m praying for you and your children during these weeks leading up to Easter. On Sunday, March 10, at 2:00 a.m. we will set our clocks forward as daylight saving; daylight savings; or “summertime” begins. What you call it depends on where you live, but either way it’s the practice of setting our clocks one hour ahead during the spring and back again one hour in the fall to give more natural, sunlight to our day. The idea was proposed by George Hudson, an entomologist, who probably needed more daylight to study insects and probably wasn’t a parent at the time. I wonder if he regretted his proposal after he had children? All jokes and grumbling aside about the lack of sleep we are about to receive, let’s be thankful and look forward to more light and more time outdoors after the long winter we just had. Please remember to set your clocks ahead one hour before you go to bed Saturday night. We would be sad to miss you all at Church on Sunday! Jody Wilkins: Living Sent in R-Kids Discipleship Co-op. Last Sunday, Jody Wilkins shared his story about what it means to live sent in R-kids. If you missed Jody’s message, read below—we think you will be encouraged by what he had to say! My name is Jody and I teach the R-kids 2nd to 5th grade class at the 1 o’clock service. I’ve volunteered at other services over the years as well, and it’s been a huge blessing to watch our kids grow as we in R-kids partner with you to disciple them to know, love, and serve Jesus. To me, living sent means walking by faith in the belief that God has called us to be right here, right now. That just like He sent the apostles...just like He sends missionaries to other countries, He sends you and me into our homes and neighborhoods and schools and grocery stores and gyms and buses and train…”to shine your light before others that they might see your good works and give glory to your Father in heaven” (Matthew 5:16). When we are saved, we are adopted into God's family, and serving is an integral part of every family. Just like being in community, being on a service team is where we can bless others and be blessed, know others and be known. It keeps me reading my Bible. I get to serve alongside other imperfect people like me. I have a family of other servant leaders that are helping me grow to be more like Jesus. I get to wear a really cool shirt. If you’re an older man, we need you to come be a grandpa in the faith to some of these kids. If you’re already a dad, let your kids see you be an example of serving faithfully in your local church. If you’re a young man (hint to you single guys and gals) we need you to come practice teaching the Bible and learn to parent- and you get to do it on someone else’s kids! We would love for you to join us in R-kids, and learn how to spread the gospel in a fun, impactful way. Please visit the connect desk in the back after service, or contact Janelle Dutcher janelle@resurrectionchurch.com. We’d love to talk further about how God has used kids’ ministry to equip our church family’s littlest members to live sent and how you can be a part of that too! 11:00 am Service and R-Kids Discipleship Co-op is Open! The weather is suppose to get to freezing temperatures tonight and snow again tomorrow! Our church will be going down to one service at 11:00am this Sunday. Kid’s ministry will be open, but the class sizes will depend on how many volunteers can make it—like many of us, our volunteers have limited means of transportation in these snowy conditions. If you are able to join us for the 11:00 service, we are looking forward to seeing you and your children! We may blend age groups, do larger class sizes, or a different style of worship based on volunteer numbers. Your safety is most important, if you do not feel safe and are unable to make the drive, please stay safe at home. The sermon will be posted on our main website for you to enjoy. In the meantime; grab some blankets, snuggle up with some hot cocoa and read this week’s lesson. Christ Connection: God used Moses to lead the people. Moses brought God’s message to the Israelites and prayed to God for the people. He acted as a mediator, standing for them before God. Moses could not do anything to make up for their sin, but we have a better Mediator—Jesus. Jesus paid for our sin on the cross and stands for us before God. When we trust in Jesus, our sins are forgiven. 6. What is worship? Worship is celebrating the greatness of God. SAY •God’s people disobeyed God, and Moses asked God to forgive them. Moses talked to God for the people. When we sin, Jesus talks to God for us. Jesus never sinned. God forgives those who trust in Jesus. SAY •God loved the Israelites. The laws were for their good. So when they turned away from Him and created an idol, God disciplined His people for worshiping a golden calf. would do their own thing. There would be no order and no way to hold people accountable for their actions. from our mistakes and help others avoid the same mistakes. On Sunday, Kelly Wilson told us her story about how she is living sent by sharing the gospel to the children in R-kids Discipleship Co-op. If you missed her message, you can read it below and hear about an opportunity to serve our church family. R-kids is our Resurrection Church kids’ ministry; the “R” stands for Resurrection, but also for “OUR”; we are a family here, and we find we have the most impact on our kids when people from the whole church body participate in this ministry: teenagers, empty nesters, parents, singles, married people, women, and men. When we have all sorts of people involved, we get to really show the kids how expansive the gospel is and what it looks like to follow Jesus in every walk of life! I want to give a special invitation to the men of the congregation—particularly because fatherlessness is very common in our region. My own father left our home when my youngest sister was 9 months old, so I know firsthand how difficult it is to get a grasp on what a loving heavenly Father is like when you don’t have that example in your earthly father. BUT I also know from my experience the impact a man who loves Jesus makes when he is involved with kids in a ministry like this. When kids see you faithfully showing up, learning their names, and caring more for their heart than their performance, they begin to connect the dots: “Ok, this man loves Jesus- maybe this is how Jesus loves me, too.” Having the privilege of serving alongside men like this in R-kids has helped my own picture of what a personal, loving God looks like, and I know it is making a big impact on the kids themselves. However, maybe you’re a father who is struggling to know what it looks like to be that godly leader for your kids—come serve with us; we have many tools and resources specifically designed to help parents bring home God’s truth to their own kids’ hearts. At R-kids we do strive to go way beyond childcare as we seek to intentionally live out the gospel to the kids, by discipling them to know and serve Jesus. We start doing this in the nursery by praying scripture over the babies, and as the children grow, we build on that foundation by planting seeds of Jesus in their hearts. Would you consider joining us a couple times a month? If God is laying this on your heart, and you want to learn how to spread the gospel in an environment that is both fun and impactful, please visit the connect desk in the back after service, or contact Janelle Dutcher janelle@resurrectionchurch.com. We’d love to talk further about how God has used kids’ ministry to equip our church family’s littlest members to live sent and how you can be a part of that too! Last Sunday was exciting to watch believers publicly profess their faith in Christ. I am always moved to tears when I see these new brothers and sisters nodding their heads yes as they answer the questions of faith and then be slowly lowered under water; then come back up as their old self washes away and their new self appears, standing before us as the crowds cheers and claps in joyful celebrating. I know baptism itself does not save but rather a symbol. But there is still so much power in this act of obedience that Christ calls us to. I also love watching kids confidently approach the water and climb in. I am usually a blubbering mess at this point, as I think of my own 3 children and how I pray for the day they profess their faith and desire to be baptized. My husband and I have the utmost honor and privilege in teaching our children the truths of the bible and guiding them as they walk out their christian faith. Sometimes it is hard for me to wait on the Lord and not want them to be baptized right away. But God graciously reminds me that only He holds the power of salvation, and everyone's story is different. Isn’t that such a beautiful thing! Let’s trust God with our child(ren)’s story and not be discouraged in training our children. He will guide our conversations and give us the grace and strength we need. As the “Sent” sermon series continues, R-kids Discipleship Co-op would love to come alongside parents through resources and events to help teach our children how to be a “sent” people for God’s kingdom! Together we will learn how God grows and builds His church and what it looks like to embrace our calling as missional families. It is so easy to use my kids and the busyness they bring as an excuse to not serve my neighbors or reach out to unbelievers in my life. Sometimes it seems easier to serve while our kids are in school, when someone can watch the littles, or just wait for a new season of life when the kids are grown. Instead, what if we saw this season in a new light. God calls us to be “sent” in every season. I know it doesn't sound easy, but what if we brought our children with us as an opportunity to teach them, and help them grow as we share the gospel and serve those in need. Express your trust in the Lord to your children, and that He has all of us right where we need to be. It is most likely that God called you to Tacoma or surrounding area for a reason, and that is to share the gospel and be His witness to those in your life. -Meeting needs in community or worldwide: When you enter people’s lives, it doesn’t take long to see a need or a way you can serve them. Help your kids to see that they are sent by God to be a light everywhere they go. This idea of sent can feel like a journey - help them see that it is as easy as taking your neighbor a meal, helping your friends with their lawn or spending time with someone who is lonely and needs Jesus and community. You may also want to find a local organization that helps those in need and go pick up supplies with your children and drop them off together. The mission doesn’t stop at our street corner or our city limits. Living sent means we can help people near and far. Many of you may support missionaries financially- invite your children in on this; teach them about the mission and why you support it, and let them know you give money and encourage them to give as well. You could even sponsor a child together through Compassion International, a program that gives your child an opportunity to exchange letters and pictures with another child, allowing your child to connect in a fun and deeper way. -Read to your child about missionaries and life in other countries: Check out biographies from your library. “The stories of Hudson Taylor, Adoniram Judson, William Carey, Gladys Aylward, and other missionary pioneers are captivating ways to orient a child’s heart on the most important things in life.” 1 Read children’s maps and geography books so they can get familiar with the world around them. (See below for a suggested booklist). As the weeks go on during the Sent series, the R-kids team is excited to partner with you to be missional and also help you practice these acts at home with your families. God does not want believers to follow Jesus alone. He gives us brothers and sisters of faith who can help us love God, obey God, and tell others about Him. We would love to hear from some of our families at Resurrection Church. 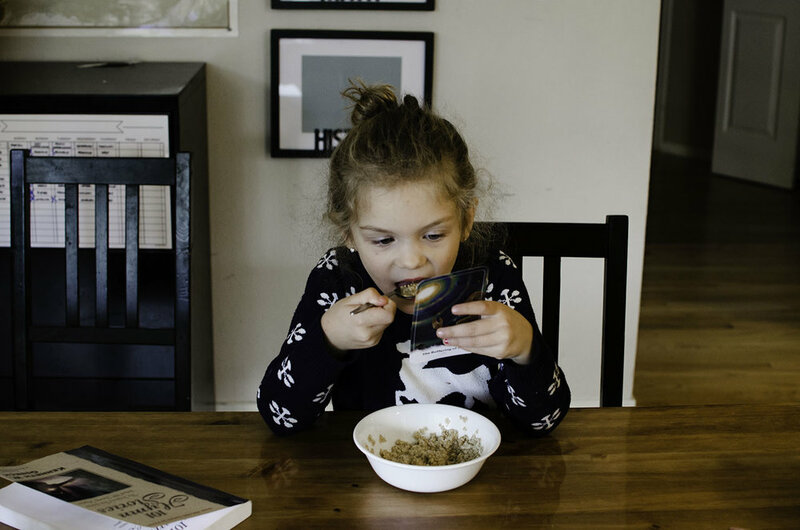 What do you do in your home to be a missional family? We grow and learn from each other, please comment below. We would love to hear from you! https://www.imb.org/wp-content/uploads/2016/09/Kids-Reading-List.pdf -click for reading list and printable checklist and book mark. https://readaloudrevival.com/48-2/ -click here and see suggested reading under the transcript of podcast. Listen to the podcast too- Sarah Mckenzie is great! https://www.compassion.com - Sponsor a child through compassion international. Voice of the Martyrs (VOM). For advent this week we will be lighting the pink candle often referred to as the shepherd candle representing joy or rejoicing. This candle also symbolize the transformation of repentance to celebration. Shepherds were lowly people, often outcasts, yet God showed them His glory in a huge way. God sent, what the Jesus Storybook Bible refers to as, troops and troops of angels armed with light to tell the Shepherds of the birth our savior, Jesus! And how did the Shepherds respond? “And they went with haste and found Mary and Joseph, and the baby lying in a manger.” Luke 2:16. Another instance that the bible mentions ‘running with haste’ was when the angel Gabriel visited Mary and told her she would be the mother of the Son of God, Mary ran with haste to tell Elizabeth the good news. This advent, I would like to have that same boldness and excitement that Mary and the shepherds had that day when they heard the news of the coming messiah. I don’t know your story, but if it’s like mine, an angel of the Lord never appeared with troops armed with light, but we can have that same exuberance as Mary and the shepherds! Reading and meditating on the Old Testament, and how they longed for the coming messiah that was prophesied, builds up the anticipation and deep significance of the birth of Jesus. Christmas means God made peace between Himself and sinners. The significance of this starts with the fall when peace was broken between us and God. Remembering all that God has done in our lives and how He shows up in huge ways - not because we deserve anything but because of Christ alone, is also evidence and motivation enough to bring us to action, and to share the good news of the Christ who has come and is coming again! We are given opportunities daily to pour the gospel into our children hearts and minds. Lets run with haste to read them about the significance of Advent and the birth of Christ! I pray that we are even bold enough like Mary and the shepherds to share the Gospel with others this Christmas season and have our children witness our joy in speaking the Truth to others and maybe they will be inspired to share the good news of Jesus as well! You can use the Family Devotional Guide to help with your conversations and what verses to read to your family. The guide is also helpful in providing a prayer and songs of joy to celebrate what God has done during the third week in Advent! 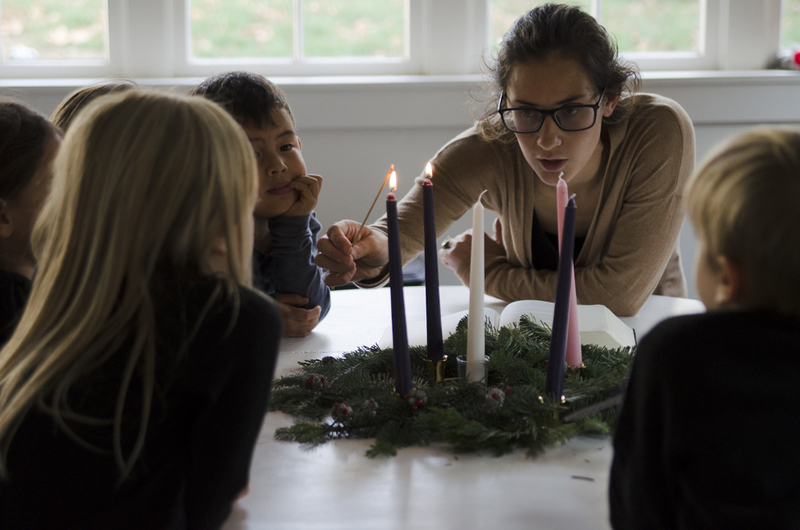 Now that week one of our Advent celebration is in the books, you are probably seeing what works for you and your family when it comes to gathering to read God’s word and discussing the meaning of Advent, and the symbolism of the candles and wreath. As a homeschooling mom, I know that “what works” can also change day by day. The Advent Family Guide is here to help you even if you can only read one section and light the candle, you’ve done enough! Remember that Jesus is always present no matter how perfect it looks, and your children will remember the moment no matter how perfect it looks as well. As my family and I went through the guide this week, I had one kid climbing on my back, while my oldest was climbing on my lap, and another slowly sliding under the table to escape. I felt myself getting frustrated and wanting to quit. The sink was full of dishes and my floors were dirty, I had too many other things to do. Then I remembered a recent time during a similar situation, when God whispered in my ear “embrace the chaos.” So I decided to push through the frustrations. I let my toddler hang on my back for a moment longer; I let my 7 year old sit on my lap but with the job of holding the Advent Guide and having to read a few lines; and I told the sneaky one to grab pens and paper and draw while we read. We may not have finished all the way through, but my kids heard the good news of Jesus coming and how we have HOPE that He will come again! We can only do our best with the chaos that is raising children and the little chunks of time available in a day, but isn’t time with Jesus always so worth it?! Whether this is your first time celebrating Advent with your children or a seasoned pro, if your bible study time isn’t looking perfect or how you imagined the moment would go, pause, take a deep breath and give yourself some grace and know that God will equip you to do enough. The reason for the Advent season is to rejoice that God became flesh and dwelt among us, so celebrate! One fun idea is to find any instruments in your house and play the songs provided in your R-Kids Advent Family Guide, hook up that bluetooth speaker, turn up the volume and make a joyful noise! My kids love singing hymns aloud while banging on their bongos, strumming a ukulele or clanging cymbals together. Not only is this fun for them, but the lyrics center our hearts on Christ, and the jam sesh gets the wiggles out making the readings go a lot smoother! God loves you so much that He wanted to be relatable and vulnerable so you would know that you could be vulnerable with Him. Go to Him this week and take the mess and chaos with you and learn about how God shows us His love through the Advent season. Those are the words that repeat in my head when I think of the Advent season. Translated from the Latin word, Adventus, meaning coming or arrival, Advent is a time of expectant waiting and preparation for the celebration of the birth of our Lord and Savior, Jesus Christ and the anticipation of His return. 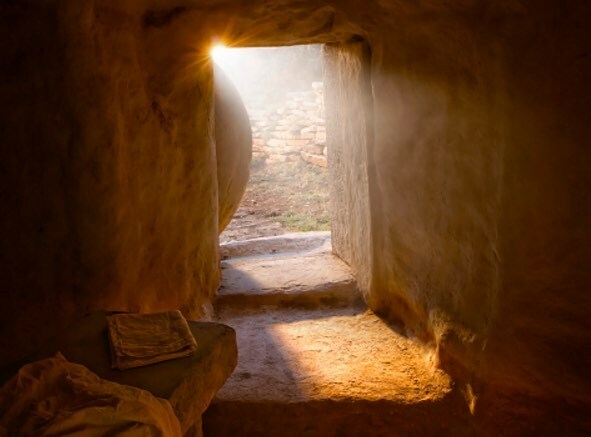 As we all know, waiting tends to be a slow process and this celebration mirrors the slowly unfolding drama of the Advent of the Savior himself in history. 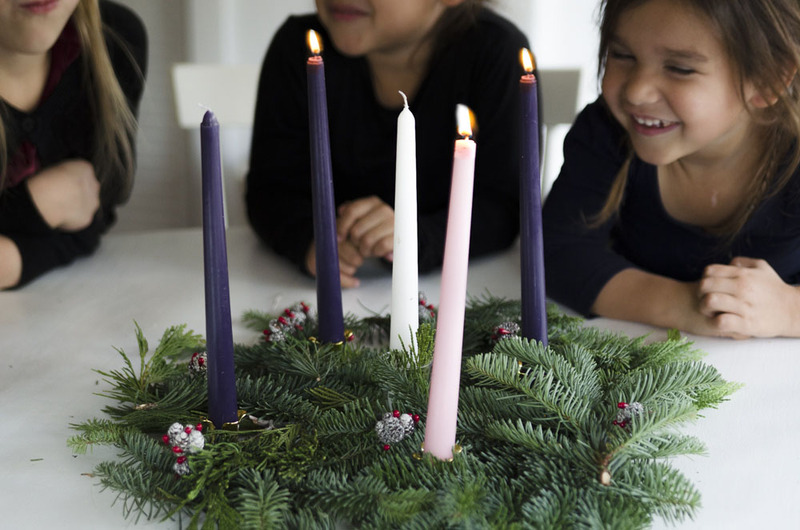 How do you celebrate Advent? The Advent season is the four weeks leading up to Christmas Day. Each Sunday, we light a candle signifying Christ’s light coming into the world, and read a promise about Jesus that God has given us through His word. 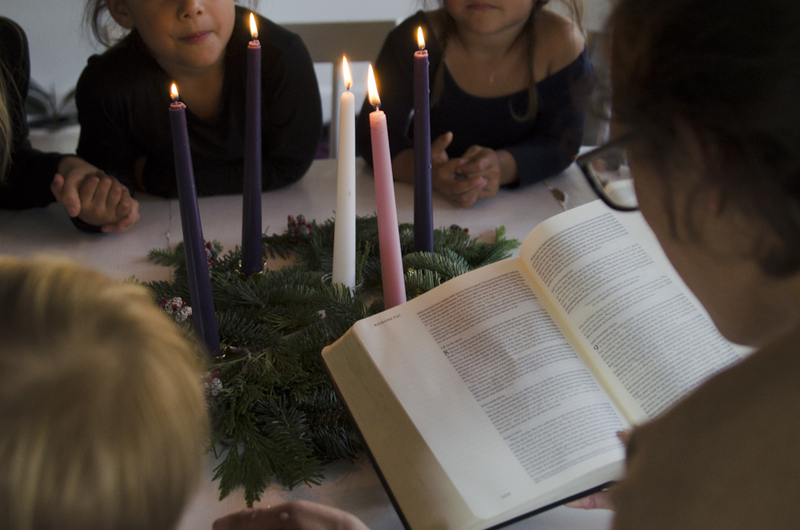 You can use the R-Kids Advent Family Guide, and set aside ten minutes each week to talk with your children about what each candle on the advent wreath represents and how we can remember the promises we have in Christ. All you need are five candles, matches and a Bible. Inside the Family Guide, you will also find scripture to read aloud that tells of God’s promises to His children; prayers; songs and hymns; discussion questions to help you further engage your family in God’s word; and fun activities as well! At times, the Christmas season can become overwhelmingly busy as we gather with friends and family and prepare gifts for loved ones. We hope that you are encouraged by the R-Kids Advent Family Guide to find the time to slow down this holiday season and reflect on the anticipation of the coming of Christ and be filled with the wonder and glory of the incarnation of Jesus Christ! 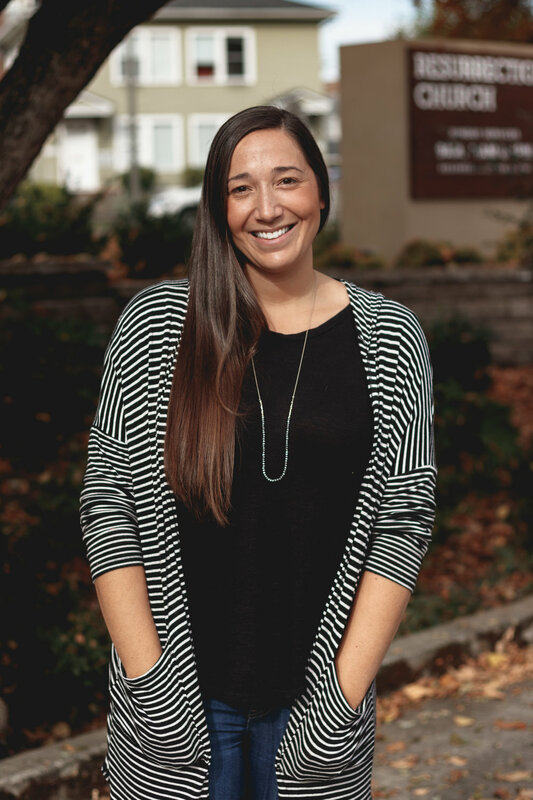 Alison Graves has been serving in R-Kids Ministry for around five years and primarily teaches in the Walking-2 class. While teaching some of our youngest church members, Alison finds great joy in praying, singing and discussing big theological concepts in ways the children will understand. Alison serves because she has been blessed by our church and lifted up by her fellow sisters during times of hardship. She feels that serving in R-Kids is one way she can give back and allow moms to sit for an hour in peaceful worship. Watch the video of Alison to hear more about her experience serving in R-Kids, what she has to say about the new Truth 78 curriculum for the toddlers, and how serving a church that values investing in the next generation of believers has brought her deep joy and gratitude. We would love for you to experience the same joy, blessing and community that our volunteers keep mentioning by serving in R-Kids Discipleship Co-op! Alex Poprozhuk starting serving in kids ministry just weeks into our beginnings as a church plant in Federal Way almost 10 years ago. During those first few weeks, Alex felt inspired by the sermons that were being preached about serving. He said there was an emphasis on serving in kids ministry and the seeds that were planted from those sermons made it easy for Alex to say yes when his good friend suggested that they serve in kids ministry together. At first, Alex helped in any room that needed a volunteer the most, but then started serving consistently in the 4th-5th grade class. Alex also helped with the set up and break down of kids ministry area. This showed Alex’s passion to serve his church by coming before and after volunteering in classrooms in order to help our church function as a mobile campus. As the church grew and more services opened up, Alex was asked to be service lead and has led ever since. Serving in kids ministry for nearly a decade has not only helped Alex grow as a leader but also as a brother in Christ. He has learned, and continues to learn from the people he serves alongside on Sundays in R Kids Discipleship Co-op. Alex’s wife Kristina began serving in kids ministry around the same time she started attending the church 8 years ago. Coming from a large family and also a background of nannying, it seemed only natural for Kristina to fill in the need that is always present in kids ministry. Throughout the years, Kristina helped out in any class that needed a volunteer the most. She has spent most her time volunteering in the 2nd-5th grade class, up until the recent birth of their third child, Mila. During her time in the 2nd-5th grade class, Kristina’s often served as a teacher. Her willingness to serve where the need was greatest took Kristina out of her comfort. God has a way of pulling us out of our comfort and showing us that He can grow and use us for His glory in ways we would never imagine. Kristina was faithful in serving in the direction God was leading her, because of that she grew as a teacher and leader in Kids Discipleship Co-op. Volunteering in R Kids discipleship Co-op quickly begins to feel like a family, and that is exactly why Alex and Kristina have continued to serve over the years. To them, R Kids has always been home and where Alex and Kristina find inspiration and the tools to love and disciple their own children. Thank you Alex Poprozhuk and family for faithfully serving our children throughout the years in R Kids Discipleship Co-op. So much has changed over the last 10 years, and you have been constant, loving and faithful leaders to our kids and Kids ministry team! Alex continues to lead at the 11:00 service, Kristina currently helps in the nursery with their youngest baby. She also supports Alex in his role as lead by being filling in the classrooms as needed and taking care of the kids on Sundays when the whole family can't make it to 2 services. Last year Renee saw a need for the kids at Resurrection Church to have a chance to worship God collectively. Wanting to use her musical gifts and experience of leading worship throughout high school and college for God’s glory, Renee sought out to provide a space for children to experience what it means to sing out loud to the Lord. On Sundays Renee Wallstrom can be found leading the R-Kids worship with songs and hand motions in the Kids Auditorium, but it is more than just noise and dance in R-Kids worship every weekend. Renee is intentionally discipling kids by leading worship and helping them understand the why of singing together by talking about the meaning of each song and giving kids opportunity to praise Jesus with a "joyful noise." To hear more about worship in R-Kids watch this short video interview with Renee and Janelle that captures the heart of discipling R-Kids through praise and worship. If you have a desire to use your musical gifting in helping others connect to God through worship - whether you play an instrument, know sign language, can help with sound or running slides you can get involved in our R-Kids Worship Team. To get more information on how to get involved you can contact Janelle or Renee at the link below. If you have never met any of the Cameron kids, I would highly recommend walking up to at least one of them and introducing yourself. Talking to them, you will feel their deep resounding Godly joy and be inspired by a family that serves out of a heart of love. 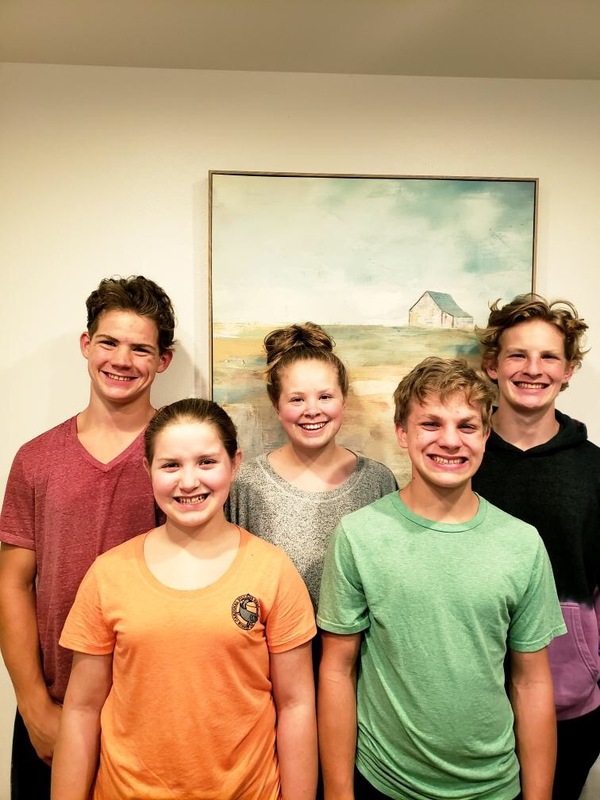 Katherine (20), Timothy (18), Kenan (16), Jared (14), and Phoebe (13) are five out of the 11 children in the Cameron Family who use their gifting to serve in R-Kids Discipleship Co-op. When asked why they serve in R-Kids, a common answer from Katherine, Timothy, Kenan, Jared and Phoebe was that they were filling a need. The Cameron’s have a heart to serve wherever they are needed most and also as a way to connect with their church and God’s people. Our own Christian walk can also be impacted by serving our littlest church attendees. While serving in R-Kids, the Lord has shown Katherine there is a lot to learn from the children that we can apply to our relationship with God. “I think it’s a good, constant reminder to have the eyes of a child when looking at life. They have no fear or worries. They trust their parents to care for them, in that same way we need to trust God knowing that He never lets us go hungry and has only the best in store for us.” Sometimes the innocence of a child can humble us to see God’s character and how he wants us to follow Him. There is not too many dull moments serving in R-kids. Children are full of emotions, energy and life. And just like adults, they are hungry for the word. Join R-Kids Discipleship Co-op and experience the joy and privilege of investing in the next generation of leaders. The DiMarcos believe serving in R-Kids provides a great opportunity to connect and share Jesus with people in the youngest age group, and they feel it is a privilege to see firsthand how receptive the kids’ hearts are to God’s word. Watch this video and learn why Betty and Frank encourage people of every age to come and see the amazing, fun, and joyful things going on in R-Kids each week. Our children’s salvation is not of our doing and is entirely up to the will of the Lord, but as parent’s we have the honor and privilege to faithfully equip our children with tools of the Bible to help guide their thoughts and give them a sturdy foundation based on the gospel. Ray and Desiree Myers volunteer in Rkids Discipleship Co-op, they also make it a priority to teach scripture to their four children; Karis, Sophia, Amare and Elias at home throughout the week to raise children who love the Lord. Next is time to open the Word of God. Desiree focuses on one Bible story all week long, but will read out of different story book bibles each day so that their children will gain different perspectives of the stories, and on the last day they read out of an ESV regular translation. Scripture memory work is also integrated into their morning time. Life and work schedules make the majority of the teaching done in the mornings with Desiree, but Ray also finds time with the kids after his work days to talk about the gospel and stories that have impacted him throughout the day. Investing time to read the bible and pray with their children, has blessed the Myers with sweet moments and conversations that they will cherish through their life and in eternity as well. During a conversation that stemmed from the family’s prayer time allowed Desiree and Ray to be present and guide their two oldest, Karis and Sophia when they first made their proclamations of faith! Witnessing the children’s different responses to the Gospel has also been some of the Myers’ greatest joys in discipling their children. Ray and Desiree feel that the gospel comes to life in their home when their children apologize and repent to one another. It is not too often that parents practice repentance to their children, but having that modeled in a home allows children to see Jesus working through mom and dad and the grace that the Lord extends to all of us. We can raise children who love the Lord by living out God’s commands in our day-to-day lives. Another way to live out God’s word is through serving as a family. The Myers starting serving in RKids Discipleship Co-Op because they wanted to model service to their own children, and it was also a practical way for Ray and Desiree to serve together. After a short time, the Myers started to see the impact that Ray’s presence had on the children in R-Kids. Raising our children to love the Lord does not need to be a daunting task. Ray and Desiree noted that 5 minutes a day with your kids reading something simple adds up to 30 hours per year. 30 HOURS! That is a huge investment done in tiny batches! They suggest to NOT stress about how well it is done or if your children are paying attention. Just seeing that is important to you will give them a perspective of the importance of the gospel.